Lineage. 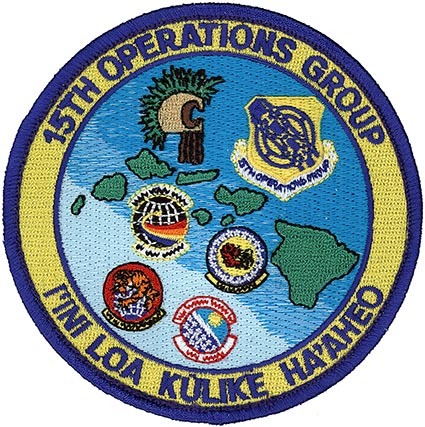 Established as 15 Operations Group on 1 Apr 1992. Activated on 13 Apr 1992. Assignments. 15 Air Base (later, 15 Airlift; 15) Wing, 13 Apr 1992-. Operational Components. Squadrons: 19 Fighter: 1 Oct 2010-. 65 Airlift: 13 Apr 1992-. 96 Air Refueling: 23 Jul 2010-. 535 Airlift: 18 Apr 2005-. Stations. Hickam AFB (later, Joint Base Pearl Harbor-Hickam), HI, 13 Apr 1992-. Aircraft. C-135, 1992-2003; C-37, 2002-; C-40, 2003-; C-17, 2005-; KC-135, 2010-; F-22, 2010-. Operations. Established in Apr 1992 as part of the objective wing reorganization, the 15 Operations Group assumed responsibility from the 15 Air Base Wing for managing operational matters at Hickam AFB and Bellows AFS, Hawaii; and Wake Island Airfield. Also provided command and control for the defense of the Hawaiian Islands and directed tactical control of Hawaii Air National Guard alert F-15 aircraft. Its 25 Air Support Operations Squadron provided combat ready tactical air control parties (TACPs) ready to advise on the employment of air assets in training and combat and to deploy worldwide with each brigade and battalion of the U.S. Army’s 25 Infantry Division and other designated ground components. Beginning in 1992, the group had one airlift squadron assigned and equipped with specially configured C-135 aircraft, which provided transportation for the Commander, US Pacific Command, Commander, Pacific Air Forces, and other high ranking civilian, military, and foreign dignitaries. Added C-37 aircraft in 2002 and C-40 aircraft in 2003; retired C-135 aircraft in 2003. Assigned second airlift squadron in 2005. In 2010, added an air refueling squadron operating KC-135 aircraft operated in conjunction with 154 Wing of Hawaii Air National Guard (HIANG) and a fighter squadron flying F-22 Raptor aircraft also operated in conjunction with 154 Wing HIANG. Decorations. Air Force Outstanding Unit Awards: 13 Apr 1992-30 Jun 1993; 1 Oct 1993-30 Sep 1995; 1 Oct 1995-1 Aug 1997; 2 Aug 1997-1 Aug 1999; 29 Nov 1999-30 Nov 2001; 1 Nov 2002-31 Oct 2004; 1 Nov 2004-31 Oct 2006; 1 Nov 2006-31 Oct 2007.